Thanks, Two Writing Teachers (or more) for hosting the Tuesday Slice of Life. This slice of life is a bit from earlier this summer, last week and when I was a child. It's like a slice of three layer cake (gluten free, for me, of course). Don't know who this bird is looking at the babies. Sometimes wrens will come to steal a nest. About 8 years ago, a phoebe built a nest on our porch. We watched her sit on the nest and later feed her 4 babies. We watched as they grew too large for the nest. And one day, when my husband got too close, they just exploded out of the nest, never to be seen again that summer! When they are ready to fly, they just up and leave. We had a nest of phoebes on our porch again this year. A phoebe came and made four starts that amounted to four small piles of stuff between porch rafters. Reading about their habits, I learned that the male typically starts nests before the female arrives, and she decides which one will be "Home, Sweet Home" to her babies. She must have selected "Door Number 3", for finally, after a little bit of time went by, the third one down the line "took" and was completed and eggs were deposited. 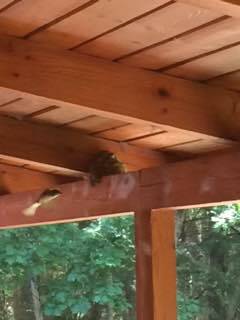 Not long before the four young phoebes departed their nest (I missed it - they left sometime during the day when I was gone), I saw the momma bird sitting on the railing with a moth in her mouth. It was in head first with wings spread out on either side of her bill. It looked like she was smiling or had a mustache. I am still disappointed in the sound of a phoebe. When I was a little girl, my mother had told me that a phoebe says "phoebe". For years when I heard phoebes calling, I was thrilled to hear them! I love that sound! While listening to the birds, occasionally I would hear what seemed like a broken phoebe. It's voice was harsh, and almost sounded like a phoebe with laryngitis... it was more like it was saying "feed me" than "phoebe". And there was definitely no polite "please" involved. I felt bad for the poor phoebe who couldn't sing! Well, certainly this must have been a mistake. Someone put the wrong voice box in this chickadee! Phoebe's say "phoebe" and chickadees say "chick-a-dee", right? After a bit of research online on various bird web sites, I discovered that the hoarse, throaty "feed-me" was actually the true phoebe sound, and the chickadee said both its name and the phoebe's name. And, to add insult to injury, it said "phoebe" much more clearly, musically and politely than a phoebe ever could. I wonder if Mom ever knew that, or if I just heard the chickadee once and assumed it was a phoebe saying it, and didn't ask about it. I'm adjusting to the new association of sound and bird. I was visiting with my sister last week I heard a phoebe call and asked her if she knew that chickadees said "phoebe". No, she did not. She was as disappointed as I. Hopefully, she will get used to the new voice of the phoebes and chickadees, too. Just when you think you couldn't possibly hold another morsel - your brain calls out "Feed me!". This one below starts out with a chickadee image but then goes to the phoebe that the person recording notices. The phoebe's call is then recorded instead of the chickadee's. Good morning! It's Poetry Friday! 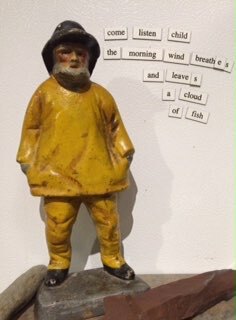 My fisherman doorstop from last Friday's Roundup was still on my countertop a few days ago (I told you he didn't have a job), and he just spoke to me again. This time, I added my first "little watercolor" using my new real watercolors on real paper as a backdrop for writing another poem in his honor! He's a fun study. Such a magnetic personality! Then I put my fisherman in his rightful place (where he thinks he has a job, but there is no door to hold) and then decided to switch the picture to a watercolor that I did with my grandson's watercolor set that I keep here for his visits. They are the typical paints in the round pots in a plastic container. These paints, though they do make colors, have a tendency to want to give you "pieces of paint" instead of blending nicely. The best thing about them is that they are what made me decide to get a few tubes of paint and some better paper than index cards. I used pen on a small index card to draw a basic outline of the lupines and then painted. This one is pretty small, and I know it is not going to win any awards (unless for sheer bravery for putting it online for the world to see), BUT it was fun, and it gave me a poem. And fun and poetry are what it's all about in my world. the Poetry Friday Roundup today! She has posted a thought-provoking poem about writing by Seamus Heaney. My husband gets the mail. A big envelope is in the box. "Oh, that's my second poem. Must be from Tabatha; she emailed it was on its way soon." I open it as we drive (our mailbox is about a mile away from our house). "Oooh! 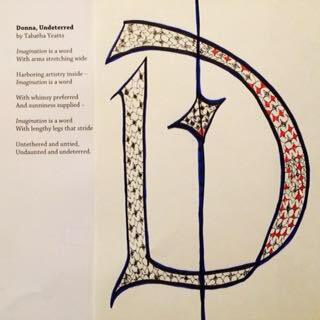 That's so nice (as I pull out the penned letter "D"). "She says she wrote a word poem - a modified sonnet - from a word that was in ebullient abundance on my blog - "imagination"." I read the note aloud to him. I read the poem aloud, also. "Imagination, huh. I don't think I've ever used that word. Is it really in "ebullient abundance on my blog"? "Of course it is. You really need to read your blog." "If I'd been drinking a latte, it would have been out my nose, the laugh came so suddenly, unexpectedly and forcefully! See, I don't even know what I'm doing or what I'm about. I like that others can see it though!" So I have gone back and read bits of my blog. Why just at the end of May I used the word "imagine" and "imagining"... Tabatha is right. I love it. Thank you, Tabatha! I love "with whimsy preferred and sunniness supplied"...and that you sneaked in "harboring"! Happy Poetry Friday, everyone! Head over to Katie at The Logonauts to put more poetry in your day! I was doing a bit of Internet research yesterday for some poetry I’m working on. I like to read articles and find out as much as I can before embarking on new writing topics. While I was puttering around on the Internet, I came across the horrific story of children’s author, Babette Cole, author of Princess Smartypants. On June 15, she was out walking her two terriers in a field, when cows with their calves approached. The cows attacked her and her dogs, appearing to be attempting to kill her and the dogs, perhaps seeing them as a threat to their calves. A man and woman were looking at a nearby house that was for sale, and they then decided to walk the land. The cows in the neighboring field seemed to be in some sort of commotion, so they looked over the fence, in time to see a dog hurtle through the air. Looking down, they discovered Babette severely injured and bleeding. The couple rescued her and she was flown to a hospital where she spent a week recovering from broken ribs, bruises and cuts requiring stitches. This was a disconcerting story, and only goes to prove that no matter how cuddly and cute animals look, they are still animals, with animal instincts... and no remorse. I may have to wait to continue my research and writing for today. I’ve been put off a bit by this incident. But this did come out of it, as I pondered the thoughts of the cows later that day. 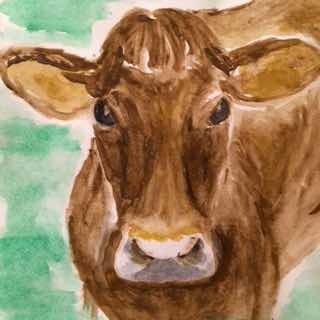 And I got out my new set of watercolors, and bravely attempted a watercolor of a brown cow after searching through 50 or so pictures of cows online. It's funny how you can know what a cow looks like right up until the minute you want to draw one, or paint one. It's also funny how one little sidestep on a path can take you to an entirely different place than you were headed, but gets you somewhere interesting nonetheless. They'd tell you no lies. Have a wonderful Tuesday, Slicers! Don't forget to link at Two Writing Teachers today with your Tuesday Slice of Life! Posting early to let people start their Friday early....and to make sure there are no problems with the postings! Welcome to Poetry Friday Mainia! It is a fun-filled five days in our area with Bath's Heritage Days in full swing! I hope you have a wonderful Fourth of July on Saturday. Meanwhile, back at our poetry party - join in the poetry action by adding your information below. Hope you enjoy reading lots of poetry to get your holiday started. Below, is an old iron doorstop that my parents had for many years. It's now at my home. I don't really need any doors held open, but he enjoys a nice spot on the floor near a door in the livingroom. 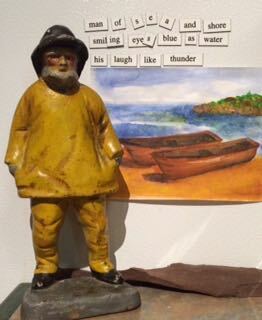 After my Tuesday post about the Coincidental Seagull, I picked up my cast iron fisherman and set him on the kitchen countertop. 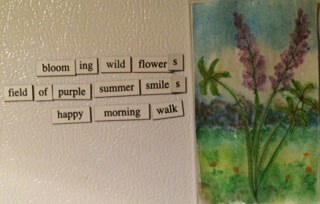 I looked at the magnetic words on the side of the refrigerator and assembled this poem. It just seemed to fit him. Then I took down some rocks I have on the kitchen windowsill to add to the rocky coast as a scene for his photo. These are rocks I collected on a trip to Newfoundland my siblings and mother took to do genealogy on my father's family. The whole setting reminded me of my grandfather who came down to the States from his fishing village of Pouch Cove, Newfoundland, as a young married man with a little baby girl. My uncle and father were born here a few years later.